Jon Thornburgh is an FAA Certified Flight Instructor (CFI) and a periodic contributor to several aviation magazines. 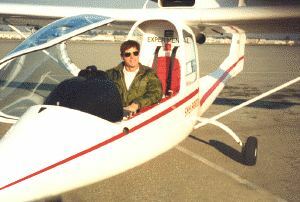 He is an ultralight instructor and an ultralight pilot examiner. He is also an FAA certified Sport Pilot Examiner and Sport Pilot Instructor Examiner for light-sport airplanes, gliders and weight-shift control trikes. Jon is licensed to fly single and multi-engine airplanes, both land and sea, as well as helicopters, gyroplanes, gliders, and hot air balloons. He is certified to teach airplanes land and sea, helicopters, gyroplanes, gliders, weight-shift control trikes, and "instrument" flying in airplanes and helicopters. Jon has written articles for the Internet news magazine, Aero News Network, as well as ASC's Aero Connections, the EAA Experimenter, Ultralight Flying! and UltraFlight Magazine. Aero News Network has archived his articles at http://aero-news.net. Jon posts the latest aviation news and tidbits at www.JonThornburgh.com. Although Jon is licensed to teach in a variety of aircraft, his goal is to make flying fun and affordable to persons of average income and limited spare time to devote to learning how to fly. That's why he specializes in teaching small, easy-to-fly sport planes. He truly believes that the new FAA Sport Pilot initiative can rejuvenate personal aviation and make it possible for almost anyone to experience the joy and thrill of flying. ’View Archive of Jon Thornburghs Articles. Matt Liknaitzky is a Flight Instructor with a Sport Pilot rating (Airplane, Glider and WSC). He is also a Sport Pilot Examiner in Airplane, Glider and WSC (Private Examiner for WSC) and holds a Commercial Pilot certificate with Airplane SEL and Private MEL, Glider and WSC ratings. Matt has flown a weight-shift control trike all over the US in 2 separate flights (here and here) and was one of the few people certificated before Sport Pilot to fly a weight-shift controlled aircraft in the FAA environment (in May 2003).